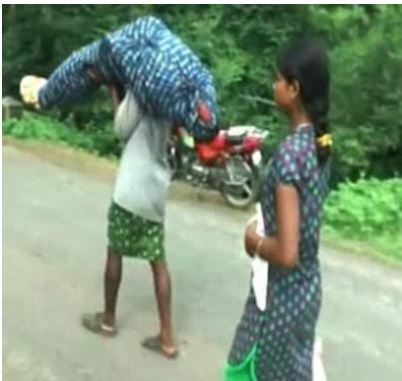 An Indian man had to carry his wife’s body on his shoulders for nearly 12 km as he had no money for a van and the hospital authorities allegedly refused to arrange one. With his teenage daughter sobbing by his side, Dana Majhi wrapped his wife Amangadei’s body in old sheets from the bed at the hospital in Bhawanipatna town on Wednesday morning, August 24th, adjusted her on his shoulders and started walking to his home in Melghar village in Kalahandi’s Thuamul Rampur block, about 60 km away. According to Indian Express, Majhi’s wife died from tuberculosis early on Wednesday morning. Left with little money, Majhi requested hospital authorities to arrange a vehicle for transporting the body. “I requested everyone, but no one listened. What option did I have other than carrying her,” said Majhi. He had walked for almost 12 km when some youths saw him and alerted local officials. Soon, an ambulance was sent which took the body to Melghar village. However, Kalahandi district collector Brundha D claimed that Majhi did not wait for a vehicle to be arranged. Adding that she has sanctioned for Majhi Rs 2000 from the state government’s funeral assistance scheme and another Rs 10,000 from the District Red Cross Fund.